With the cooler temperatures comes the threat from a group of fall related pests. We call these pests “fall invaders,” and they survive the winter through the protection afforded by structures. They migrate towards buildings in search of a warm resting spot to wait out the winter months. This resting spot may include the walls, ceilings and attic voids of buildings. Changes in daylight hours and cooler temperatures can trigger the fall invaders’ move to indoors. Normally, only the adult cluster flies and box elder bugs move indoors. During their winter stay, these fall invaders do not reproduce or feed. A second type of fall invaders, the foreign grain beetle and hairy fungus beetle, often arrive in our structures by accident. These beetles are attracted to building lighting and are tied to exterior environmental conditions. These fall invaders are mold feeders and are associated with grain in poor condition. Based on their numbers, fall invaders can elevate beyond nuisance status, especially in sensitive environments like food processing plants where insect contamination is a serious concern. Some can stain surfaces and create offensive odors in addition to being a nuisance and contamination threat. Probably the most common of the fall invading insects, the box elder bug feeds on box elder and maple trees. It is one-half inch long as an adult, and mostly black in color with red lines marking the wings and the thorax or area behind the head. 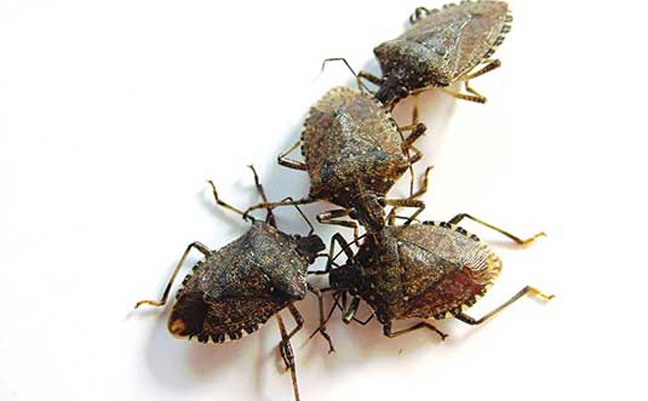 In the eastern and midwestern parts of the U.S. the brown marmorated stink bug has become commonplace. Recently, this bug has been discovered as far as the West Coast of the United States. It is both an agricultural pest and structural pest. Adults are brown in color, five-eighths inch in length and have a shield-like body shape. There are several species of flies that overwinter in structures. Cluster flies and face flies are the most common, and tend to cause the most concern since they often appear in groups. Adult cluster flies are slightly larger than a house fly. The wings overlap each other over the abdomen unlike the house fly, whose wings appear to be more of a triangular pattern at rest. Multicolored Asian lady beetles get their name because they can vary in color and markings. The wing color can vary from tan to reddish orange, and they can have a varied number of black spots. These insects are predaceous on plant pests like aphids. They achieve pest status as they migrate indoors in the late fall months. The hairy fungus beetle is associated with mold and is attracted to light. It can be confused with a common stored product pest, the cigarette beetle, due to its small size, color and shape. This beetle is oval with three clubbed antennae. The antennae of the cigarette beetle are saw-like in shape and not clubbed. The foreign grain beetle is a common late summer and fall invader. It feeds on grains in poor condition and the fungus associated with the deteriorating grain. This beetle is typically one-sixteenth- one-eighth inch in size. It looks similar to flour beetles in color and body shape, but is smaller and more attracted to light. Large amounts of these beetles can be found in insect light traps. The following practices can be used at different stages of a pest management plan, depending on the type of treatment necessary and the type of facility. Ideal temperatures for interior overwintering locations range from 40–50⁰ Fahrenheit, which are typically found in the exterior wall voids or attic spaces of buildings. Denying the insects access for these ideal harborage sites is the first line of defense in control. Use of sealants, door seals and screens are the primary exclusion tools in preventing entry. It is best to seal after insects leave the building and before re-entry in the fall or late summer. Since some of these insects, like the foreign grain beetle, can be attracted to structures by light, light management is considered another important step in pest management. Use exterior lighting, which is the least attractive to insects. When possible, illuminate buildings with lights mounted away from the structure. Many fall invaders are also more attracted to building exteriors with contrasting colors. Although it may be impractical to paint or change the building color, this knowledge can be useful in ensuring these areas of contrast are effectively sealed. Perimeter treatments with insecticides can be used to supplement exclusion efforts. The applications should be made to areas where the insects are resting and entering the building. Timing of the applications can be critical to achieving good control. If the timetable for exclusion and preventative pesticide treatment was not met and the insects make an unrestricted journey into a facility, insect light traps may be helpful in eliminating some of the insects that are not confined in ceiling or wall void spaces. Insects can also physically be removed by vacuum. If vacuums are used, the contents should be emptied directly after use since some fall invaders release foul odors that can damage equipment if not immediately discarded. Regardless of the species, the threshold level for pests in food processing plants and food distribution centers is zero. Just as humans gear up for the cold winter months, so are pests. It’s crucial to understand, prepare for and eliminate the threats that fall invaders may pose as they seek safety from the seasonal change.